Product prices and availability are accurate as of 2019-04-22 10:13:23 UTC and are subject to change. Any price and availability information displayed on http://www.amazon.com/ at the time of purchase will apply to the purchase of this product. 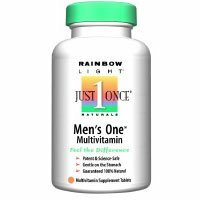 2 Bottles of 150 Tablets Rainbow Light Men's One Multivitamin provides comprehensive nutrition and protection Each tablet contains key ingredients that support heart, prostate, and reproductive health, help bolster immunity, and increase overall energy. One tablet has complete B-complex vitamins for energy, 800 micrograms (200 percent DV) of folic acid for heart health, and 800 IU (200 percent DV) of vitamin D3 for colon, bone, and blood pressure health. Men's One is specially formulated with herbs and food-based nutrients that address men's nutritional needs.